Christopher Catherwood (born 1 March 1955) is a British author based in Cambridge, England and, often, in Richmond, Virginia. He has taught for the Institute of Continuing Education based a few miles away in Madingley and has taught for many years for the School of Continuing Education at the University of Richmond. He has been associated each summer with the University of Richmond's History Department, where he is its annual summer Writer in Residence, and where most of his recent books have been written. He is the son of Sir Fred Catherwood. He was educated at Westminster School, Balliol College, Oxford, Sidney Sussex College, Cambridge and the University of East Anglia. 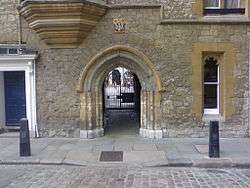 Since 1994 has been linked to St Edmund's College, Cambridge. In 2001, he was a Rockefeller Fellow at the University of Virginia's Virginia Foundation for the Humanities and Public Policy, and in 2002 was briefly a consultant to the British Cabinet Office's former Strategic Futures Team of their Performance and Innovation Unit. In 2002, he was a consultant to the Strategic Futures Team of British Prime Minister Tony Blair. He has been a Fellow of the Royal Geographical Society and a Fellow of the Royal Asiatic Society. For his religious and historical non-fiction work he was elected a Fellow of the Royal Historical Society in 2005. In December 2008, he appeared as a cameo character in the online novel Corduroy Mansions by Alexander McCall Smith, who wrote a positive review of his book on Churchill's creation of Iraq in The New York Times. In 2008, he was a Crosby Kemper Memorial Lecturer at the Churchill Memorial and Library, Westminster College in Fulton, MO. In 2009, he was a Marshall Lecturer at the George C. Marshall Center at the Virginia Military Institute. In the same year he was also an Osher Lecturer at the University of Richmond, VA. In 2010, he was a Winston Churchill Memorial Trust Traveling Fellow (at the Evelyn Waugh Archives at the Harry Ransom Center at UT Austin, at the Fitzroy Maclean Archives at the Alderman Library at the University of Virginia, and at the OSS Archives at the National Archives in College Park MD). In 2010, he again appeared as a cameo character in a second Alexander McCall Smith novel, The Dog Who Came in From The Cold. He currently teaches students from Connecticut College, Tulane, Villanova, Wake Forest and other American universities in the Cambridge-based INSTEP program, teaching 20th century history and also church history. He is a Key Supervisor for the JYA Programme at Homerton College, Cambridge. and is an SCR Associate of Churchill College, Cambridge, at which college he was the Archives By-Fellow for Lent Term 2008 for his work on Winston Churchill and the Second World War. Christopher Catherwood is the son of Sir Frederick Catherwood (former Vice-President of the European Parliament), and maternal grandson of the preacher Dr. D. Martyn Lloyd-Jones. He is married to Paulette; a piano teacher, daughter of the late Reverend John S. Moore, for many years the editor of the Virginia Baptist Historical Register. He and Paulette are members of the evangelical Cambridge city centre Anglican church, St Andrew the Great. ↑ "Churchill's Folly, Cambridge Spies". The New York Times. 9 December 2005. Retrieved 30 April 2010. ↑ Waters, Florence (17 December 2010). "A literary experiment with its own plot twist". The Daily Telegraph. Retrieved 21 August 2015. ↑ Charmley, John (27 November 2004). "Last exit from Mesopotamia". London: The Guardian. Retrieved 14 July 2008.